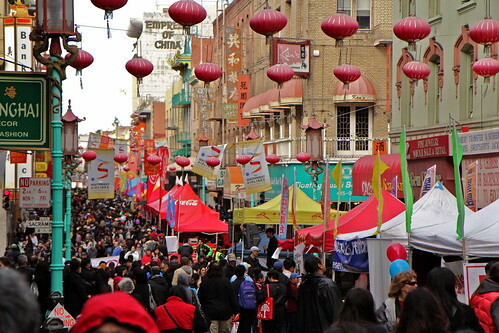 Crowds of people browse, buy, shop and play at the Chinese New Year of the dragon festival on Grant Street, Feb. 11, 2012. Photo by Tearsa Joy Hammock / Special to Xpress. In the U.S., the new year is celebrated with drinking, raucous behavior and lasts a day. 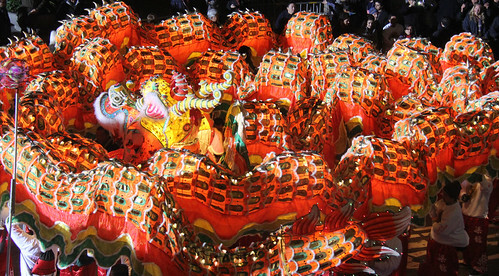 In China, the Spring Festival celebration lasts at least two weeks, even up to a month. One of the largest worldwide celebrations of its kind outside of Asia, the Chinese New Year festival in San Francisco is two-weeks long, including events such as the mini-procession and ribbon cutting in Chinatown, the Flower Fair, the Chinese New Year 10K Run, the Miss Chinatown USA pageant and ending with the Lunar New Year parade. Although the Lunar New Year officially began Jan. 23, this year’s parade didn’t take place until Feb. 11, nearly three weeks later. The history of beauties and legends such as the Moon Goddess have been part of Chinese literature, dating over 4,000 years ago. 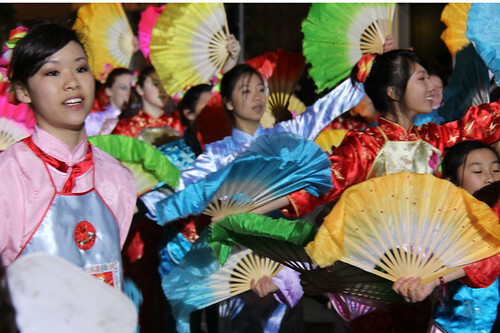 It wasn’t until 1953 that San Francisco’s Chinese Chamber of Commerce decided to incorporate the “Miss Chinatown” pageant into the Lunar New Year festival. Fifth in the cycle, 2012 is the Year of the Dragon, a symbol representing power and authority. 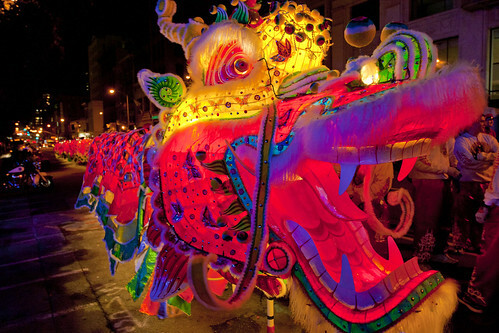 At the end of the parade each year, there is a 250-foot long dragon known as “Gum Lung” or Golden Dragon. There were many first-time attendees this year as well. 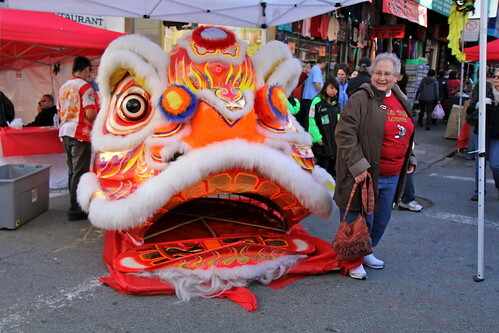 Elaine Cotton of San Jose, poses so her family can take her picture with the grand finale dragon for the Chinese New Year parade Feb. 11, 2012. Photo by Tearsa Joy Hammock / Special to Xpress. Fan dancers parade down Geary Street during the Southwest Airlines Chinese New Year parade Saturday, Feb. 11, 2012. Photo by Mihail Matikov. 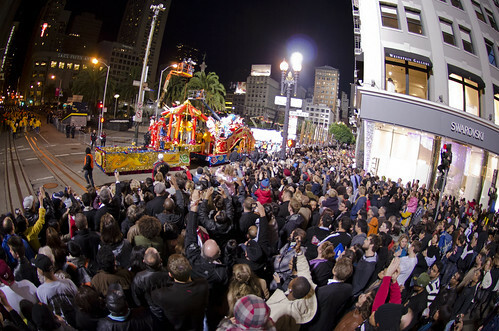 Thousands of people gathered in downtown, filling the streets surrounding Union Square as well as Market Street and Chinatown. Floats themed with Chinese culture to marching bands filled the 1.3 mile stretch of parade route with fireworks, music and spectators at the Southwest Airlines Chinese New Year Parade Feb. 11, 2012. Photo by Gil Riego Jr. Parade attendees examine and photograph a Chinese dragon float before it heads out to finish the Southwest Airlines Chinese New Year Parade Feb. 11, 2012. This float was constructed and sponsored by Thunder Valley Casino Resort. Photo by Jeff Sandstoe / Special to Xpress. Participants at the Southwest Airlines Chinese New Year parade lift the main final dragon along Market Street, in celebration of the Lunar New Year Saturday, Feb. 11, 2012. Photo by Mihail Matikov.